Taking a local group trip? Rent a 20 passenger minibus for events in San Diego like bachelorette parties, off-site meetings, basketball games, campus tours, and more. You’ll have plenty of room for your group members and personal belongings with this vehicle. Ready to book your trip? Call us at 619-209-7804 to learn more and receive a free, no-obligation quote. We’re experts in planning transportation services for weddings, corporate events, sports tournaments, school field trips, and more. Our reservation specialists are available 24/7 and are looking forward to hearing about your upcoming event! Offering a slightly more spacious interior than its predecessor, the 20-passenger minibus is still suitable for relatively small groups that require a couple of extra seats. Plan your bachelor or bachelorette party with all your favorite people in this comfortable minibus. This compact 18-passenger minibus is the best transportation solution for relatively small groups traveling for an event. Whether it’s a small business outing or a private vacation, this minibus offers comfort along with a sleek and streamlined design for busy San Diego roads. As the largest model of minibus that we charter, the 25-passenger minibus is best suited for groups who need plenty of space but may not have enough passengers for a full-sized bus. Your group will have optimal storage space without an unnecessary number or empty seats. 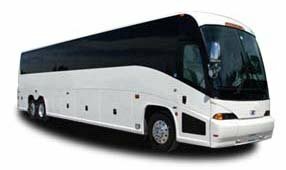 This full-sized charter bus is best suited for groups traveling for large-scale events like business conferences or even school field trips. Full-sized coaches can comfortably fit large groups and offer the most amount of storage space and more extensive amenities than minibuses.